A friend of mine recently advised me that I should refrain from doing TV shows like 20/20 because “they don’t serve me” and they won’t sell my memoir. But I don’t do them to serve myself, nor do I do them to sell my book. If someone bought my book expecting it to be an inside look into the life of a noncustodial mother, they would be reselling it on ebay in short order. Hiroshima in the Morning is about motherhood, yes. How I didn’t want to be a mother, how I had to reconfigure motherhood in order to remain in the lives of the children I loved, about losing my own mother to Alzheimer’s. But it’s also the story of finding oneself in a new place, about Japan, war, history, storytelling and memory. As for serving myself, my motherhood is one aspect of me, and as my boys grow up and start looking at college and find summer jobs halfway across the world, my role in their lives is changing. In two short years, public response to my family is radically different; it has moved from outrage to gratitude. There are many women out there who are tired of equating female and sacrifice. As one friend pointed out, we readily agree that we should put on the oxygen mask first so we can help others in the case of an airplane emergency. Why is it so hard to accept that a woman might be more than a mother, and that that ‘more’ might enrich her family as well? I speak out because no one else is asking: What if nurture wasn’t considered feminine? How much better would our society be? How many women, families and men would be allowed to bloom and create their lives as best serves them? Nurture and love should be the priorities for our society. And as our social contracts break down and we decide we are too poor and threatened to fund education, or make sure our citizens have a place to live and food to eat, or to stop poisoning our environment because that costs more; as the gap between rich and poor becomes dangerously large; it is too easy to point to women and put the burden for nurture on their backs in the name of the “mothering instinct.” That is very clearly not serving us. We need a new paradigm. And watching the old one kick and fuss on its way to extinction is a very good sign. Storytelling is a radical act. By sharing our own truths, we can heal, reveal, inspire, and challenge: literally recreating the world. In memoir, honesty is everything, but re-living our experiences and turning life into art can be one of the most challenging things we do. This workshop will help you find your central question and use it to find the shape of your manuscript. You will learn to be kind to your characters (including yourself) and also ruthless. You will balance an immersion into your past with the safety of the present. We will talk about placing your personal story in a broader social context. Join me in one of the world’s most idyllic writing settings, Hedgebrook, the retreat that supports extraordinary work by visionary women. More information here, and on hedgebrook.org. On CNN/Opinion today, a piece about motherhood. “‘There is such a horrible stigma to not being a full-time mother, and I tend to shy away from letting the mommies in my online parenting community (which I’ve been with since they were infants) know that I’m choosing not to have the kids live with me. It’s looked at as such a selfish decision, but I chose it because it was truly best for them, even though it does cause me intense pain. Thank you for writing, each and every one. I have not forgotten your words. Shortly after the meltdown began, I talked with Joy Behar on her show about the effects of radiation on the atomic bomb survivors in Hiroshima, some of whom I interviewed for my memoir, Hiroshima in the Morning. Radiation is invisible, and easily dismissed as being prevalent in the atmosphere. The effects of radiation are obscured (at least as far as many scientific studies) by other factors in modern life. But that does not mean that they do not exist, or that they will fade away. Nearly seventy years after the first atomic bombing, we are still unable to protect ourselves from the literal fallout of our own poisonous creations. 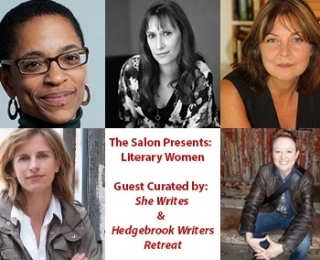 Talking women writers with some wonderful women writers with Hedgebrook, She Writes and Goddard connections. Come join us! Lisa Dierbeck is the author of the novels The Autobiography of Jenny X and One Pill Makes You Smaller, a New York Times Notable Book. In 2010, she co-founded Mischief+Mayhem, an independent publisher run by established authors in association with OR Books. The New York Observer has dubbed it “the book industry’s new danger brigade.” Frequently anthologized and twice nominated for a Pushcart Prize, her work has appeared in numerous literary journals and in such publications as The Boston Globe, O, the Oprah Magazine, The New York Times Book Review and Time Out New York. Rahna Reiko Rizzuto’s memoir, Hiroshima in the Morning, is a National Book Critics Circle Finalist, among other honors. She is the author of Why She Left Us, an American Book Award Winner, a U.S./Japan Creative Artist Fellow, Hedgebrook alumna, and a faculty member at Goddard College. Rizzuto has appeared widely in the media, including The Today Show, The View, 20/20, The Joy Behar Show, MSNBC-TV and PBS-TV. Her articles have been published internationally. Martha Southgate is the author of four novels. Her newest, The Taste of Salt, was published in September 2011 and was named one of the best novels of the year by the San Francisco Chronicle and the Boston Globe. She has received fellowships from the MacDowell Colony, the Virginia Center for the Creative Arts and the Bread Loaf Writers Conference. Her essay “Writers Like Me,” published in the New York Times Book Review, appears in the anthology Best African-American Essays 2009. Previous non-fiction articles have appeared in The New York Times Magazine, O, Entertainment Weekly, and Essence. Amy Wheeler is a playwright and the Executive Director of Hedgebrook, a retreat and residency for women writers on Whidbey Island that supports women writers whose stories and ideas shape our culture now and for generations to come. Amy holds an MFA from the Iowa Playwrights Workshop, and her work has been seen in New York, San Francisco, Seattle, Portland, and Atlanta.